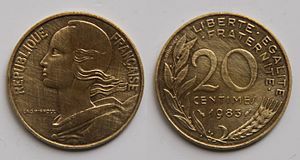 Centime (from Latin: centesimus) is French for "cent", and is used in English as the name of the fraction currency in several Francophone countries (including Switzerland, Algeria, Belgium, Morocco and France). In France the usage of centime goes back to the introduction of the decimal monetary system under Napoleon. This system aimed at replacing non-decimal fractions of older coins. A five-centime coin was known as a sou, i.e. a solidus or shilling. In Francophone Canada ​1⁄100 of a Canadian dollar is officially known as a cent (pronounced /sɛnt/) in both English and French. However, in practice, the form of cenne (pronounced /sɛn/) has completely replaced the official cent. Spoken and written use of the official form cent in Francophone Canada is exceptionally uncommon. In the Canadian French vernacular sou, sou noir (noir means "black" in French), cenne, and cenne noire are all widely known, used, and accepted monikers when referring to either ​1⁄100 of a Canadian dollar or the 1¢ coin (colloquially known as a "penny" in North American English). 1 Subdivision of euro: cent or centime? Subdivision of euro: cent or centime? In the European community cent is the official name for one hundredth of a euro. However, in French-speaking countries the word centime is the preferred term. Indeed, the Superior Council of the French language of Belgium recommended in 2001 the use of centime, since cent is also the French word for "hundred". An analogous decision was published in the Journal officiel in France (2 December 1997). In Morocco, dirhams are divided into 100 centimes and one may find prices in the country quoted in centimes rather than in dirhams. Sometimes centimes are known as francs or in former Spanish areas, pesetas. This page was last edited on 30 January 2019, at 01:03 (UTC).